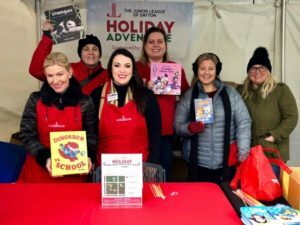 Long a part of many families’ holiday traditions, Holiday Adventure, formerly known as Holiday Hunt, takes children ages 2 to 12 on a fun and educational journey through the Dayton Holiday Festival. Children will participate in a scavenger hunt with four different stops: exercise, reading, crafts, and snack. At each location, after completing the activity, a volunteer will stamp or sign-off on the participation sheet and those children completing all stops will receive a special gift! Holiday Adventure is part of the Dayton Holiday Festival’s Grande Illumination Tree Lighting, the official kick-off to the holiday season each year. Held in Downtown Dayton, the Dayton Children’s Parade, Tike’s Shop, Wonderland Windows display at the Schuster Center, ice skating, and festive entertainment are some of the many attractions that will make downtown shine during the holiday season. The Holiday Adventure takes place each year at Courthouse Square on the Friday immediately following Thanksgiving. For information about how to support this event, please contact the Junior League of Dayton at community@jldayton.org. Thank you to McAfee Heating & Air for their generous continued sponsorship of the Holiday Adventure!